Pain relief measures after gallbladder surgery vary according to the setting; the type of surgery performed; and the number of days since the surgery. Pain control in the hospital may involve intravenous or injectable narcotics while patients at home may take milder pain medication by mouth. 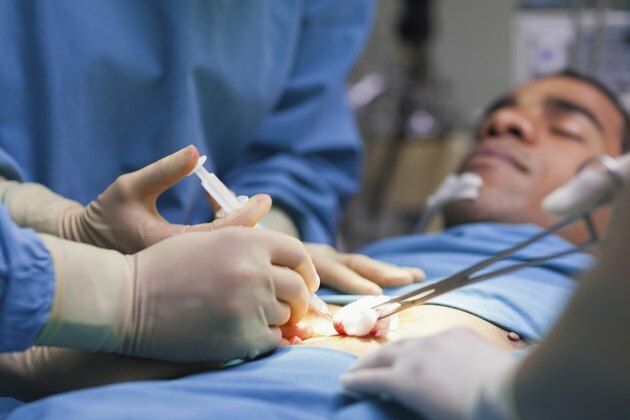 Open surgery through a relatively large abdominal incision may cause more severe wound pain, while laparoscopic surgery--using a tiny video camera and special instruments--may cause more gas pain because of the carbon dioxide injected during the procedure. Pain levels decline over time, with the most severe pain experienced during the day of surgery and the following one to three days. Rate the level of the pain using a scale of zero to 10. A rating of zero indicates no pain and a rating of 10 indicates the worst pain of your life, according to the American College of Surgeons. Tailor your pain control strategy to your needs. During the first few days, you may require stronger pain medication than you will need later in the recovery process. If you can, distinguish gas pain from incisional pain and address it appropriately. Take prescribed medications exactly as ordered. For severe pain, your surgeon may prescribe narcotics such as oxycodone, morphine or hydromorphone, according to the American College of Surgeons. Be prepared for side effects, including drowsiness, low blood pressure, nausea, difficulty urinating, slow heart and breathing rates or constipation. While in the hospital, you may have a PCA, or patient-controlled analgesic, device that delivers a premeasured dose of narcotic pain medication when you push the button. You may also receive narcotics by intravenous line or by injection. At home, you will probably take pain medication by mouth. Take over-the-counter medications for mild pain. NSAIDs--nonsteroidal anit-inflammatory drugs such as ibuprofen, naproxen and aspirin--relieve pain and inflammation but may cause side effects such as stomach upset or bleeding, according to the American College of Surgeons. Check with your surgeon before taking over-the-counter medication. Walk several times a day for increasingly longer distances to relieve gas pains. Laparoscopic surgery involves injecting carbon dioxide into the abdominal cavity, so patients undergoing this type of surgery feel uncomfortable until the gas dissipates. Eat high fiber foods to avoid constipation, especially if you are taking narcotics for pain. If you do not have a bowel movement by the third postoperative day, you may need to request a prescription for a stool softener. Hold a pillow over your abdomen before coughing to reduce pain, the American Academy of Surgeons recommends. Use firm pressure against the pillow. You may also use this technique, called splinting, when getting out of bed or turning in bed. Practice relaxation techniques such as guided imagery, meditation, self-hypnosis or controlled breathing to reduce anxiety and pain, advises Sandra Nettina, author of the 2010 edition of the "Lippincott Manual of Nursing Practice." Focus on something other than the pain, suggests Nettina. Try knitting, music, reading or other activities that engage your interest and distract you from discomfort. Apply an ice pack to the operative site, recommends Nettina. Ice treatments work best when the pain is localized to a particular site. Evaluate your pain level 30 to 60 minutes later to determine if the comfort measure was effective. If you are experiencing severe, persistent pain, contact your surgeon for advice. For the first day or two, you may need to take pain medication around the clock at the prescribed intervals, rather than taking it as needed, says Nettina. Taking it on demand provides less relief and may set up a dependency on narcotics. At home, plan your activities around your pain medication schedule. If you plan to walk at a certain time, for example, you may need to take your pain medication an hour in advance. If, however, the medication makes your drowsy or confused, consider taking it after the walk or asking for a milder drug.